A few months ago when this product first came out I bought it out of sheer curiosity. It was creamy and definitely a no-no for my super oily skin. But like the good makeup addict that I am I bought it and stashed it away until the winter. Frankly I had no intentions of seriously using it. My perfect shade is New Guinea (Med/Dark 5 –Dark with Red Undertone) but as usual, dark foundations for skins with blazing red undertones are not carried at the likes of Sephora. I bough mine directly from the NARS website but this color is also available at Nordstrom.com and Beauty.com. Unlike with NARS pressed powder foundation, for this product you can purchase the foundation + sponge separately from the mirrored compact made for this product. The compact has a long mirror and vented holes in the bottom of one compartment where the foundation sponge . can sit. 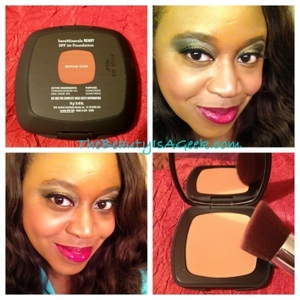 The product applies easily and provides sheer to medium coverage. If you have dry skin the sponge probably applies the product just fine but if you have oily skin like myself with acne scars, the sponge does okay but it’s obvious how splotchy the finish is. The best way to apply this foundation is to use a kabuki brush (preferably retractable) and buff the product onto the skin. I found this method much better for covering my acne scars than simply using the sponge (is this sponge latex free?). Now, back to the allergic reaction. The case of peorial dermatitis that I caught had my upper lip area from my cupid’s bow to the tip of my nose itchy, irritated with scaling skin. As the skin healed I could not use my oil-free NARS foundation to cover it at all as it would dry out the skin and make things even worse. NARS Radiant Creamy Concealer did help a little but what melted into the dry, cracked skin crevices and made it look human for awhile was this foundation. It did not make my skin itchy and was quite soothing so in the end I am very glad I purchased this to have on hand. I’m much better now but I can honestly say this is a nice foundation to have if you are prone to eczema and eczema-like skin conditions on your face/neck. I can’t say the sponge is really worth purchasing–especially if you have oily/sensitive skin. Load up your compact with disposable non-latex cosmetic wedges you can purchase from Target. Simply use one/two and toss away. Better control to apply in hard places like the nose bridge and tear duct areas of the face. If you have very dry to normal skin this foundation is a very good value for the money. I don’t like how the compact is in the left side and when I hold the compact I tend to pop the foundation out as I’m holding it in my left hand. Wish this was on the right side instead. For oily/sensitive skin I would only use this in the winter and then only in dry patch areas. Oiler skins are better off using NARS Sheer Matte (my gold standard for oily/sensitive skin foundation) or NARS Tinted Moisturizer finished with NARS Pressed Powder Foundation. NARS Radiant Cream Foundation in New Guinea–great for eczema-prone or peorial dermatitis-affected skin! 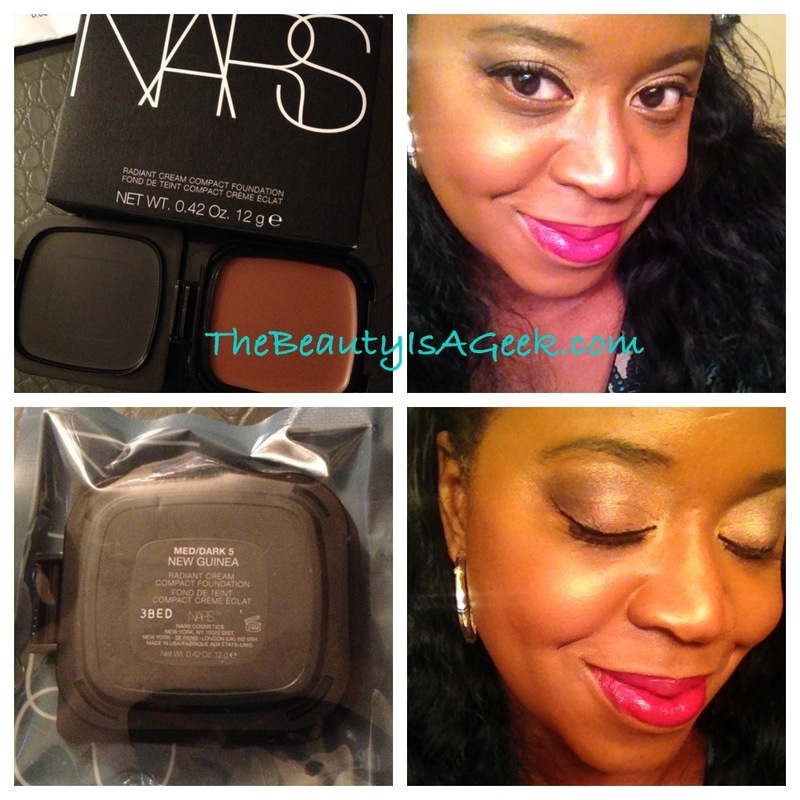 What I wish NARS would really do is make this same compact but with the pressed powder foundation for oily skins. Now THAT is something this beauty geek would love to have in her stash. Please, NARS? Pretty Please? 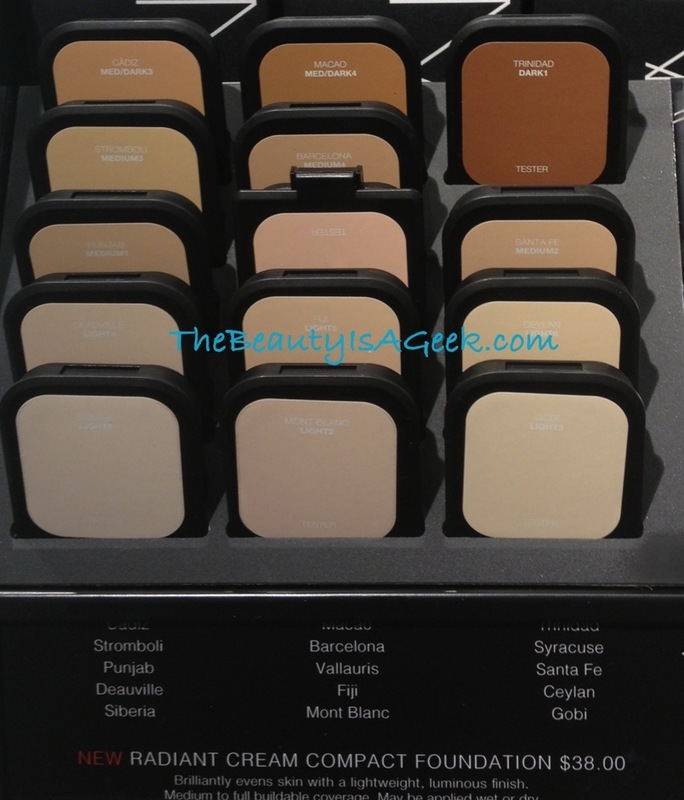 Looks like Make Up For Ever has a brand new foundation out and in a wide range of shades! 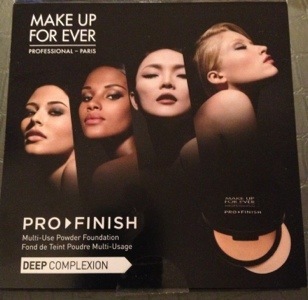 New for Spring 2013: Pro Finish Foundation from Make Up For Ever. FYI: The brown girl in this photo is wearing Shade #177. 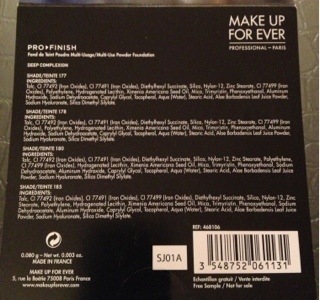 Make Up For Ever’s new Pro Finish foundation looks to be direct competitor to MAC’s ubiquitous Studio Fix foundation. Available in a range of twenty-five (25) shades, it can be applied wet for a sheer finish or dry for a matte and full coverage finish. I’ve never been quite pleased with the existing powder foundation from MUFE so it is very exciting to see this new product and formula. 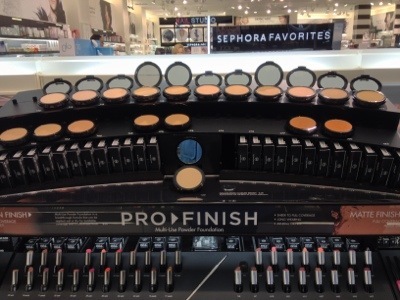 MUFE Pro Finish foundation on display at Sephora. And yeah, the Rouge Artiste lipsticks are great too! 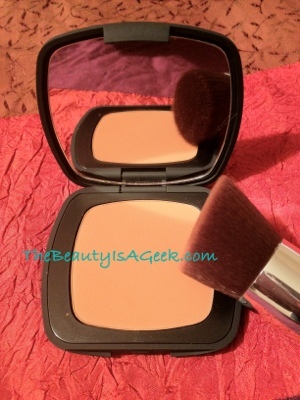 I tried applying this to my bare skin in Sephora using the new tapered foundation kabuki brush. The foundation went on flawlessly and the tapered brush expertly laid the foundation down in those challenging areas of the nose bridge and eye sockets. 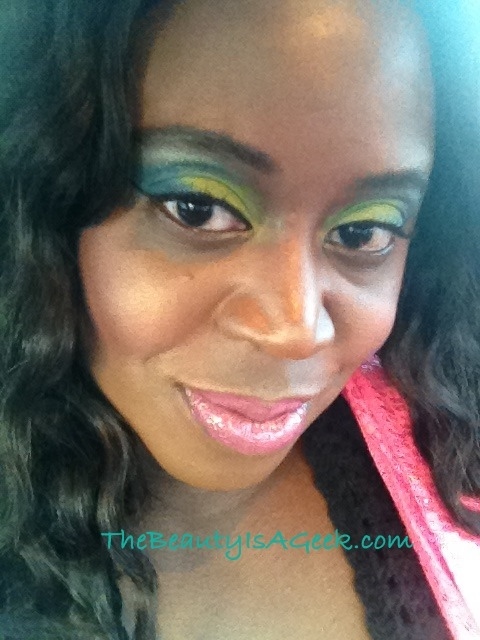 It was very easy to blend when dry and the resulting finish was nice and matte. I believe a sponge applicator is included with the compact but if you are prone to breakouts as I am, toss the sponge and go with the foundation brush. 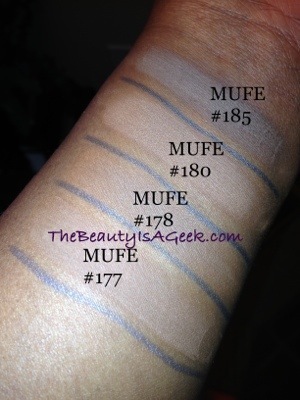 Even with all of the swatches I’ve shown here, my ideal shade is #175. Why this color was not included in the Deep skintone sample card is beyond me. 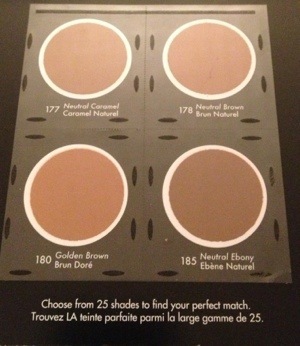 Interesting how I am #75 in the Velvet Matte formula and #175 in Pro Finish. 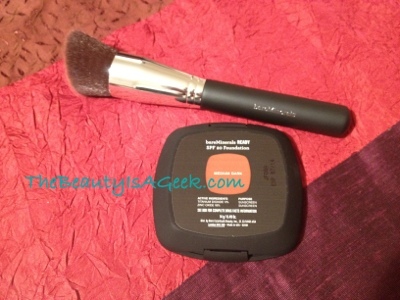 Definitely check out the foundation Kabuki brush. I am beyond impressed with how well it applies and blends this foundation. The bristles are soft and deliver practically mistake-proof application. This is definitely on the list to be reviewed/Florida Tested when I head to Disney World in July. 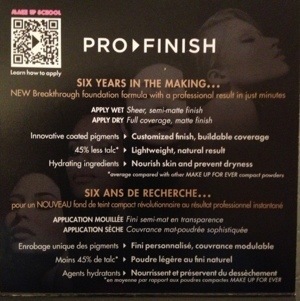 Make Up For Ever’s new Pro Finish Powder foundation is now available exclusively at Sephora stores and Sephora.com. NEW! 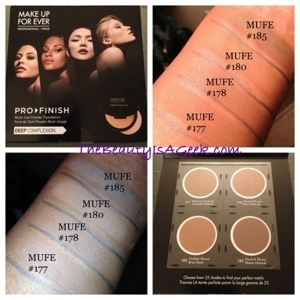 MUFE Pro Finish Foundation. 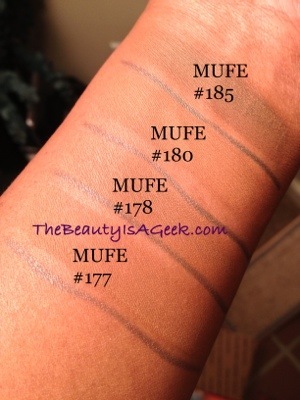 All swatches are on bare MAC NW43/MUFE Velvet Mat+ #75/NARS New Guinea skin. 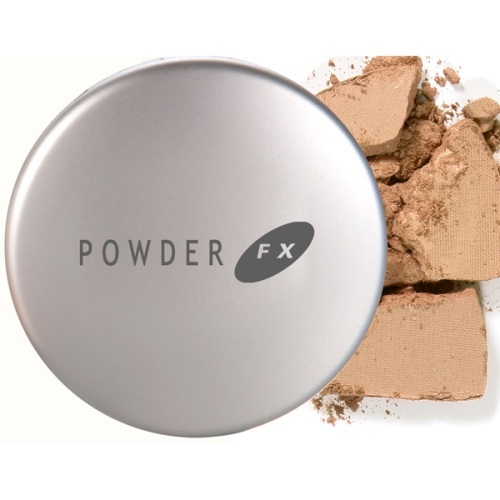 Anyone who has ever had to deal with oily skin in the heat and humidity of Florida knows how invaluable powder foundation is to keeping your complexion fresh. My grandmother (whom I inherited my crazy oily skin and who had no wrinkles even at age 60) always had her handy powder compact within reach. So when I returned recently to Florida for a family vacation at Disney World, I knew I couldn’t arrive there without any. Last year I used Bare Escentuals mineral powder and while it was okay, it was messy and caused all kinds of packing problems I didn’t want a repeat of this time. And as I’d been meaning to try the color diverse and dermatologist developed Canadian beauty brand CoverFx for quite awhile, I decided to take the plunge. 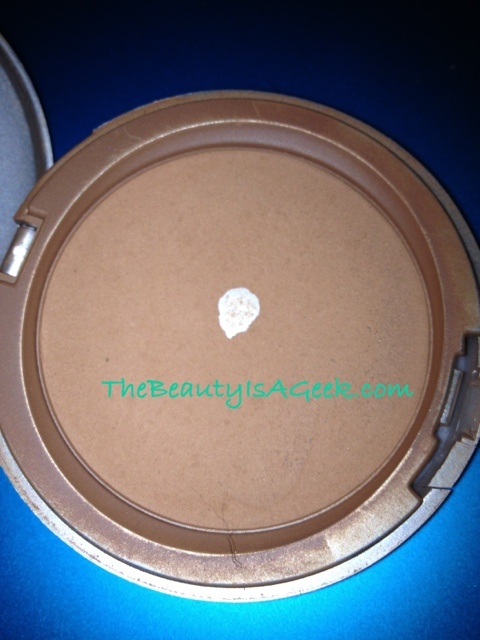 CoverFX’s Powder FX Mineral foundation. Perfectly milled and excellent for hot temperatures. 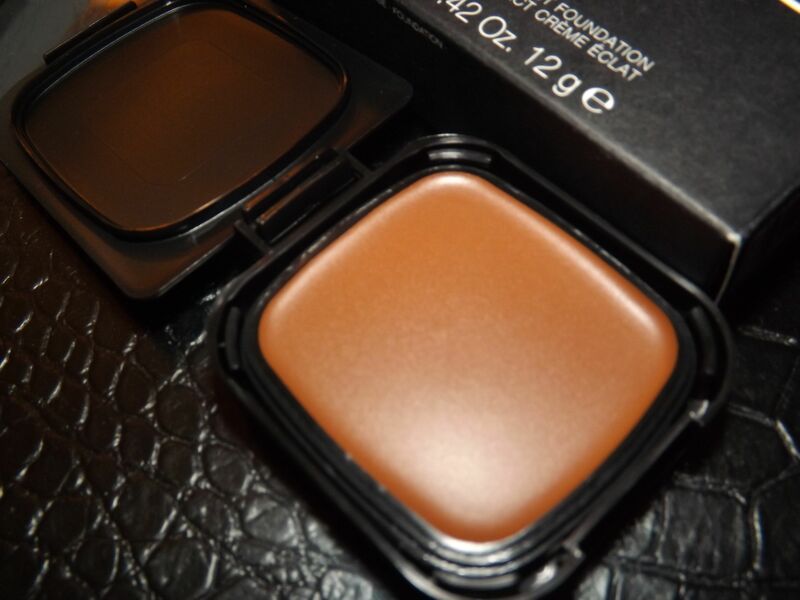 CoverFx SPF10 pressed powder foundation contains .42 ounces (12 grams) of product and comes in a very sleek lightweight plastic/aluminum compact complete with mirror. The physical sunscreen consists of the natural ingredients of Titanium dioxide (3.5%) and Zinc Oxide (3%). Its low profile packaging makes it easy to stash in your purse or theme park swingpack without taking up more precious space that it needs. A small sponge comes with it but if you have oily skin I would recommend tossing it. 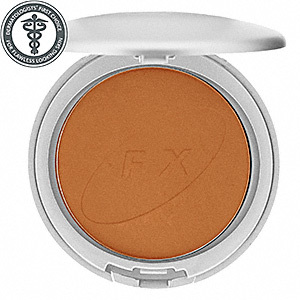 It is embossed with the CoverFx logo with plastic protector and the powder is very silky and well-pigmented. The shade I chose was B25 which was a very good match for my NW43 about to go to NW45 skin in the Florida heat. My main use for this pressed powder was to finish my look and keep my oily skin at bay while using NARS Pro-Prime primer and their new Tinted Moisturizer. 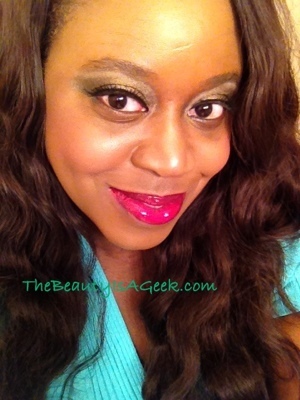 After using the NARS primer and tinted moisturizer in, I used the EcoTools retractable kabuki brush to blend the CoverFx powder into my skin to take the dewy shine off from the tinted moisturizer and provide a matte finish. Because of the dense pigmentation, it is very easy to build coverage to the intensity you desire without looking ‘cakey’. CoverFX does sell a sheer touch-up powder but as I have super-oily skin I decided the foundation was a better buy for me. A unique feature about this product is that it is printed with an expiration month and date. As I go through a lot of pressed powder during the year I’d use mine up well before the expiration date. What I like is the implication as to the freshness of the product and I like that. In the morning before heading out one of the Disney theme parks, I applied the NARS Pro-Prime primer, Make Up for Ever Full Cover concealer under eyes and on acne scars, then blending in NARS Tinted Moisturizer in Martinique, then buffed the CoverFx SPF10 foundation into my skin. The powder felt very light and I did not use much as I wanted a natural look and only needed to take the ‘dewy’ look off of my skin. My skin felt very comfortable despite the 90 degree heat during the day (and about 90 – 95% humidity). While I did sweat, my skin did not itch because of the powder nor was it irritated by the active ingredients in the sunscreen. Twice during the day I gently blotted the sweat off of my face and reapplied a light dusting of the CoverFX SPF10 powder and my complexion was refreshed quite nicely. In the evening after a shower, I again applied NARS primer first, then tinted moisturizer and concealer, then built up the color of the CoverFX SPF10 powder foundation on my skin for a more formal and flawless look. Although in the evenings I spent more time in air conditioned restaurants, my complexion still looked fresh, flawless and comfortable. I didn’t bother with touch-ups in the evening as the temperature was cooler (lot 70’s) and humidity lower at night during Easter in Florida. Because of the lower SPF in this product, the strong Florida sun rays did penetrate to darken my skin, but I’m please to say it did so very evenly. The darker shade of this powder compensated for my skin’s browning in the Florida heat. Side note: I did bring my lighter shade of NARS tinted moisturizer (Martinique) with me because it was Spring in Florida and not summer. Even when I darkened to NW45, the color adjusted flawlessly. B Series Color for CoverFX. Love how deep the colors run! 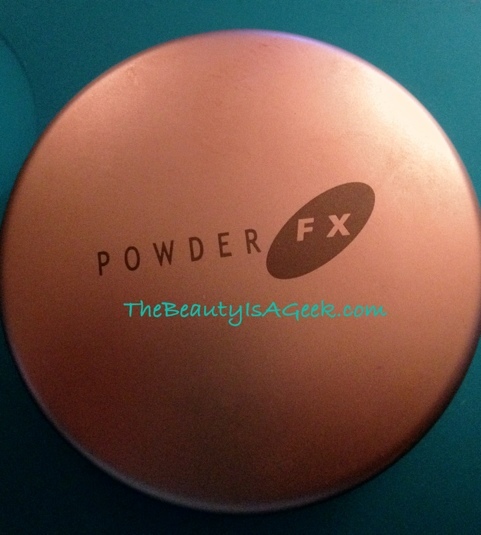 My Powder Fx SPF 10 pressed powder–my new favorite finishing powder. Back of package. Note the printed expiration date–nice! 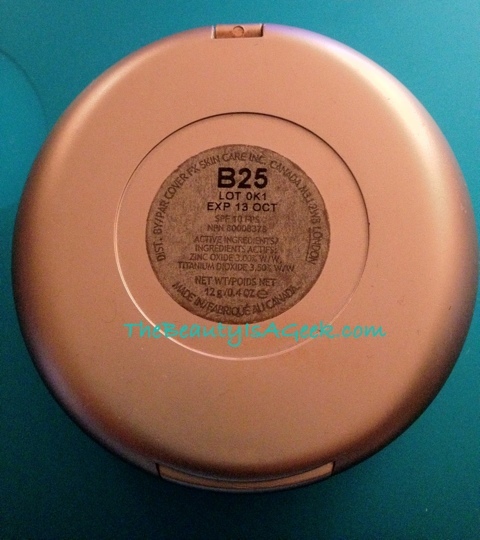 My well-loved Powder Fx SPF10 Mineral foundation in B25. Concealer is a beauty product I discovered was indispensable for ‘erasing’ my sleep-deprived caused dark circles under my eyes from too many all-nighters as an Engineering student in college. It’s also been a godsend for covering my acne scars and any evidence of late night partying. 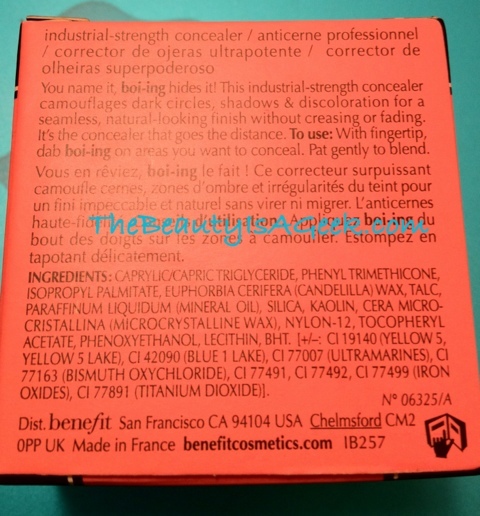 So as soon as I got word from The Muse that her highly-recommedned Boi-ing concealer from Benefit Cosmetics was being produced in darker shades, I was on it in picoseconds. Obviously other gals had gotten wind of this because I had to go to two Sephoras and three Ultas before I finally found one to take home with me. Yeah, this is as dark as it gets for now. Weighing in at a hefty 3.0 grams (0.1 ounces), it comes in a black screw-top shallow plastic pot encased in a paper ‘peep’ box. The cream is slightly stiff to the initial swipe of a finger, but warms to your body heat and spreads nicely when using your finger. If you use a concealer brush the stiffness takes a bit longer to go away as the product warms to your skin. I noticed no product ‘drag’ as I do with my MAC Studio Finish concealer but it wasn’t as smooth going on as my NARS concealer. 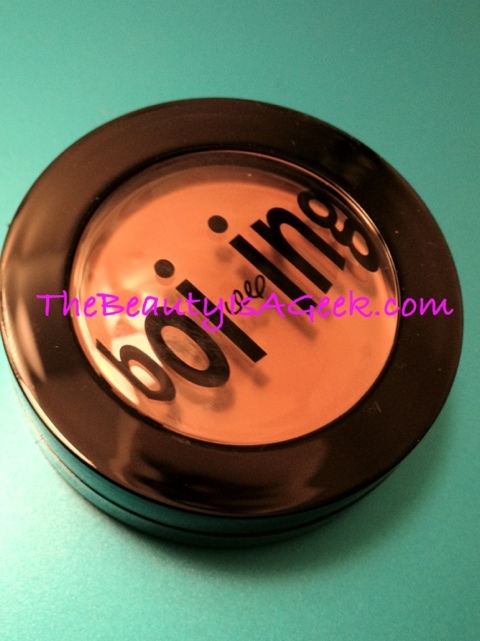 Unfortunately this product did crease on me (and perhaps because I have very oily skin) and I had to use a little bit of MUFE HD translucent powder to set it and discourage any further creasing. The pigmentation is very good and I was able to cover my light acne scars as well as I have been with my MAC Studio Finish concealer or my MUFE Full Coverage concealer. It is a shade lighter than my MAC Studio Finish concealer and about two shades lighter than my NARS concealer. 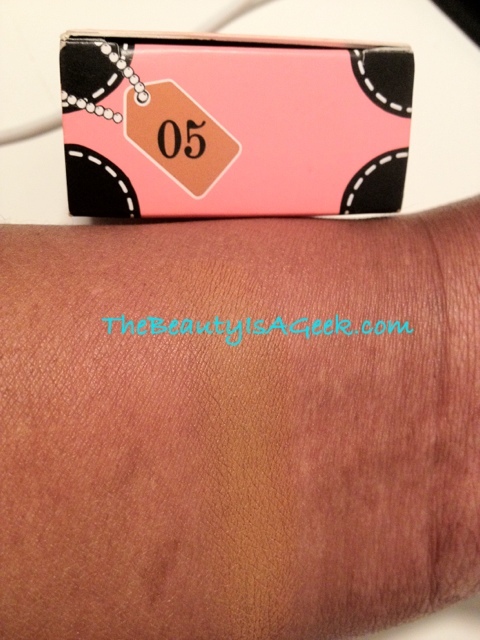 Benefit’s Boi-ing Concealer in #5 (deep). 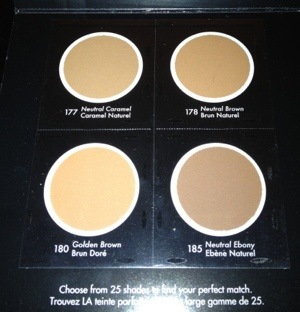 One of my biggest peeves with Benefit is that their concealers did not come in darker shades for beauties of color. It seems they’ve finally listened to this market. I am dissappointed that there wasn’t a deep color with yellow undertones and a darker espresso-like color for deeper undertones. #4 color is best suited for those NC42 and under while #5 for NW 45 and under. My second pet-peeve is this product contains mineral oil (paraffinum liquidium). While not the first ingredient, if you have sensitive skin and want to try this, I highly suggest purchasing from a retail establishment that takes returns like Sephora or Ulta. I have sensitive skin and haven’t had a reaction to this product so far after almost two weeks of use but I took a chance. 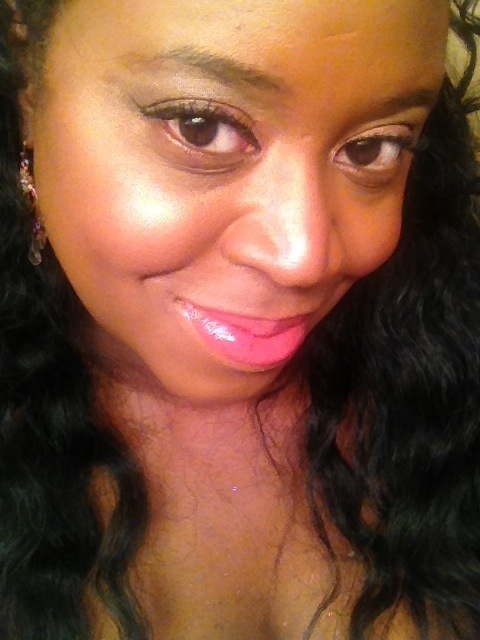 Overall I am pleased with this concealer but it is only because Benefit made one that fits my skintone. 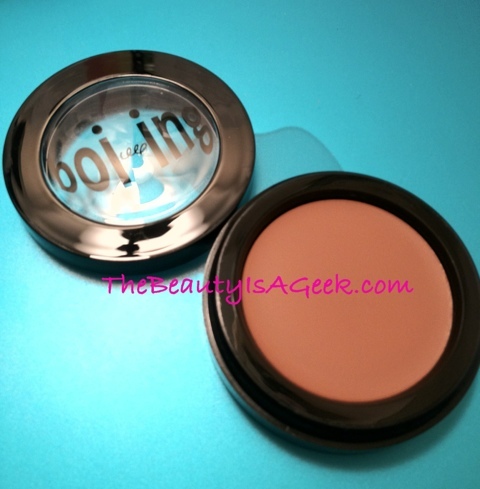 Were I an NW45 – 47 this may work best as a color corrector rather than a concealer. There’s Mineral Oil in this?!? Why?!? An interesting point to note is this product is made in France, not the US. I find French-made cosmetics to be of very high quality so I believe that has a lot to do with the very nice performance of this product. 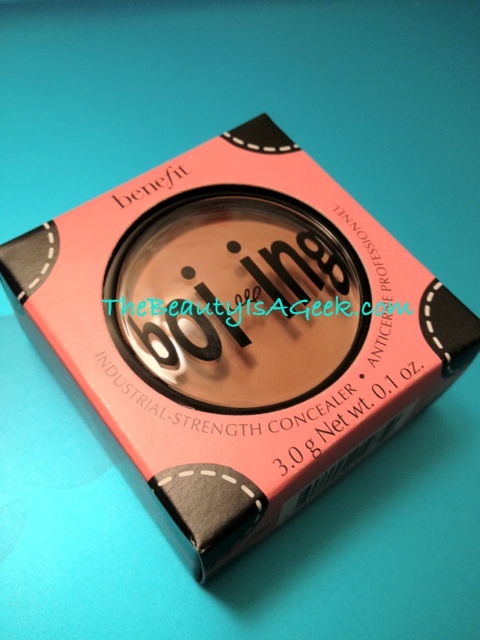 Benefit’s Boi-ing concealer retails for $19 USD and is available at Sephora, Ulta and other upscale retailers.